At Koetter Woodworking, we are passionate about mouldings. We control every step of production, from kiln drying green lumber to delivering mouldings to our extensive dealer network via our company-owned truck fleet. This enables us to maintain the necessary quality and service levels to provide heirloom-quality products for your home. Our photo galleries, Stock Moulding Catalog, and interactive tooling library & architectural design program – envisionIT™ are all accessible on this site to help you in the design process. Our knowledgeable dealer network is ready to partner with you, your builder, and architect to bring your dream to a reality. 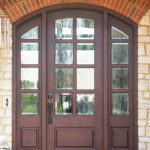 Like fine furniture, choosing the right doors can dramatically affect the overall look and feel of your home. Every door Koetter Woodworking manufactures is carefully hand-crafted from some of the finest woods available. Backed by our limited Lifetime Warranty, each hand-assembled, furniture quality door features traditional stile and rail construction, providing lasting strength and durability, creating doors to last a lifetime. Whatever architectural design your project calls for, Koetter Woodworking is sure to offer a door that expresses your personal style. Please be sure to visit our photo gallery, Solid Wood Doors selection catalog, and our extensive drawing library – envisionIT™. A stairway is often the main focal point when visitors enter your home. Design choices, such as: specie selection, stain or paint, or whether to use wood or iron balusters, will ultimately determine the statement your stair makes. Whether you are looking for the simple lines of Arts & Crafts styling or the old-world charm of iron, Koetter Woodworking offers a broad array of styles and species that adapt to any décor. Need some help with design ideas? Check out our stair photo gallery and Stair Parts catalog, or contact one of our knowledgeable dealers to help walk you through the design process. “Specialty Millwork” encompasses Curved Millwork, Specialty Columns & Pilasters, Pediment Heads for doors and entryways, Raised Panel Wall Systems, and much more! These items are highly custom, and are typically designed specifically for your project’s application. Whether in a media room, in a library, or anywhere your project designs call for Specialty Millwork products, Koetter Woodworking is here to serve your needs. Our master craftspeople work hand-in-hand with Koetter product engineers, ensuring high-quality, precision-made products for residential and light-commercial applications. 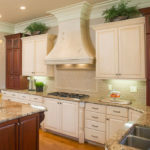 Visit our photo gallery to view an assortment of Specialty Millwork applications.